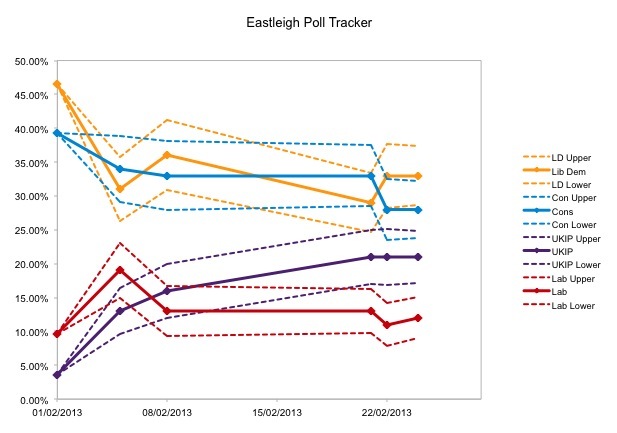 With only one day left until polls open in the Eastleigh by-election, we look back at all the opinion polling of the campaign to try and determine the state of this most important of races. There have been five public opinion polls since the resignation of Chris Huhne on February 5th, plotted on the chart above (the first point on the chart is the 2010 General Election result). Two have been conducted by Survation (here and here) for the Mail on Sunday, one by Populus (here) for the Times and two by Ashcroft Polling (here and here), who also use Populus for their fieldwork. The full results and fieldwork dates can be seen in the table below. The chart at the top of the page shows each poll and also the approximate 5% margin of error bounds for each result (calculated on the basis of the actual sample size that provided voting intention information in each case). There was also a sixth poll, by the local newspaper the Daily Echo, though their methodology has not been published and they describe it as a “non-scientific” survey, which we have therefore not included. Several things can be seen from this display. Firstly it is clear that both the Conservatives and Liberal Democrats have lost votes since 2010, the Liberal Democrats more so than the Conservatives, and the two parties are now fighting in close contention somewhere just above the 30% mark. 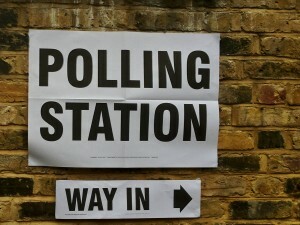 Which of the two parties actually is ‘ahead’ at this point is not quite so clear – the first Ashcroft poll and the second Survation poll put the Conservatives narrowly ahead, whilst the first Survation poll and the second Ashcroft poll, as well as the additional Populus poll, put the Lib Dems ahead. As can be seen from the chart below, the margins of error of all these polls overlap as far as the Conservatives and Liberal Democrats are concerned. On balance, the Liberal Democrats appear to retain a narrow advantage – a straight averaging of all five polls gives them a one point lead over the Conservatives, whilst a weighted average that gives more emphasis to the more recent polls gives them close to a two point lead. The polls themselves, however, do not tell the whole story. In such a tightly contested election the relative turnout of each party’s supporters will almost certainly prove decisive, making their “ground games” crucial to the determining the final outcome. Here the Liberal Democrats would seem to have a stronger advantage. They hold every council seat inside the Eastleigh constituency with a much stronger local party organisation than anyone else. This has enabled them to bring a larger number of activists to the campaign and to reach more voters in more ways than the other parties have been able to. In the second Ashcroft poll, when voters were asked what contact they had received from each party, the LibDems had a small but significant lead on every measure, from phone calls to posters to door-to-door. The large number of expected postal votes may also give the Lib Dems an advantage, enabling their superior ground game to ‘lock in’ a large number of votes before polling day. 14,267 postal votes have been issued in this by-election, up from 12,644 in 2010, and nearly two thirds of them have already been returned. This high proportion of postal ballots also reduces the chance for last minute events to influence the outcome of the election. As to what might still have the potential to shift public opinion among those yet to vote in Eastleigh, it seems that local concerns dominate the priorities of the voters. The ongoing media furore over allegations against Lib Dem peer Lord Rennard would seem to some to be meaningful, however, as with Chris Huhne’s resignation, the impression of politicians generally in the minds of most voters is already so negative that it is unlikely to significantly alter their perception of any particular party. In the first Survation poll only 10% of Liberal Democrat voters said that Chris Huhne’s resignation had reduced their chance of voting Liberal Democrat and though no polling in Eastleigh has been done on reactions to the Lord Rennard story, it seems unlikely that a scandal involving a relatively unknown figure would have more impact than one involving the local Eastleigh MP. The only party with significant upwards momentum during this campaign is UKIP. From 3.8% at the General Election and 13% at the start of the campaign, they were by last weekend polling into the low-to-mid twenties – a near six-fold increase. When considering that polls conducted by Populus and Ashcroft did not include UKIP in their initial voting question as the Survation polls did, it is possible that the last two polls on the chart understate UKIP support by several points – meaning that it has continued to increase at a faster rate than the chart initially indicates. Already UKIP is within the margin of error of the Conservatives (shown by the overlap of the dashed blue and purple lines on the far right) and very slightly overlapping with the Liberal Democrats on the Survation poll (dashed orange line). In either case, UKIP are within touching distance of second place, and with reports from Eastleigh suggesting their ground game has been surprisingly organised, it is conceivable that they will pass at least one of the two main parties by polling day. Where is UKIP Support Coming From? Interestingly, looking at the cross breaks in all of the polls, UKIP seem to be increasingly taking as many votes from the Liberal Democrats as from the Conservatives, suggesting they have managed to fill the niche that Labour had hoped to occupy as the anti-government vote, and possibly a more general anti-politics vote. If UKIP continue to take more votes from both main parties and manage to maintain their momentum, then anything is possible. Despite UKIP not even being included as a possible answer in the last Ashcroft poll’s question “Regardless of which Party you might vote for, which Party do you think is most likely to win the by election in Eastleigh?”, the possibility that they could pull off a surprise outside victory, as George Galloway did in Bradford West a year ago, should not be entirely discounted.